What are the odds of finishing in the money after a slow start? Of the teams that will eventually go on to win their full-season league, 80% of them will finish the month of April in 1st, 2nd, 3rd or 4th place. Expressed otherwise, 80% percent of the time, a league’s eventual winner will already be sitting in a money spot after one month. This research is from a 2003 article by Scott Wilderman (who now runs OnRoto.com) and Matt Watson in the now-defunct Sports Weekly Fantasy Hot Sheet entitled, “Do I Still Have a Chance? Recovering from a Slow Start.” Within the piece is a table labeled, “% of time eventual winner was in each actual standings place.” Using their commissioner service archives, it charted where the league winners were in the standings on the 1st and 15th of each month during the season. And they showed that, on average, your league’s eventual winner will already be in a money spot after one month 80% of the time. Intuitively, the two month time period has always made sense to me too. 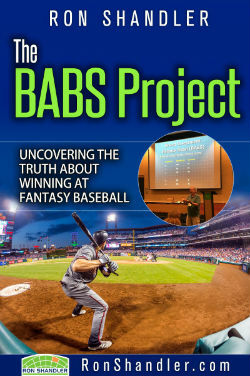 In fact, I wrote a piece a few years ago that proposed that the major league season (and hence, the fantasy season) should be split into 50-game chunks. We’d take one week off in between each period that would be dedicated to intense analysis (similar to pre-Super Bowl week) and conducting new fantasy drafts. The incremental improvement month-to-month after April is tiny, relatively speaking. A good portion of the season is already determined after one month. Over the years, I’ve heard about and experienced many anecdotal incidences of teams coming back from huge deficits to take league titles. Admittedly, these are isolated outliers. You always remember the one team that storms back. That’s the guy who gets an article written about him. That’s the story we tell to our grandkids. Nobody remembers the other half dozen stragglers in the same league that failed. yes, I totally believe that kind of info to be accurate. and of course, that presents a problem if it is a redraft league. i am a commish of only one league…but we actually have a lot of the money won in the playoffs. and for years we allow the top 8 to be in the playoffs. this year someone complained that they did not think it was right to let people with less than .500 to be in the playoffs, so after a discussion, I agreed to change the constitution to read top 6 in the playoff, the bottom 6 have a consolation playoff. i am sure there are a lot of good replies to why this isn’t all right, but as far as the commish is concerned, I want as many people having fun, and keeping interest for as many as possible. a couple of years back, we had a guy fight hard from 12th place to make 8th place, and he ended up winning first place in the playoffs. he was a very good player, just a lot of early bad luck. some were not happy, but I basically told them if they really want to gamble try another league. this league is set up to keep interest and fun for everyone, and it has lasted for years. none of the early complainers have ever left this league. I agree with you. Whenever you have playoffs, there is always a chance that a low seed will win, and that’s okay. It’s more important to keep people engaged and that’s a way to do it (frankly, even if it means letting a sub-.500 team in). You can always split the pot – half to the regular season winner, half to the playoff winner. this year 2012016 8 teams make the playoffs. noone has quit other than they just did not have the time to play. Speaking of slow starts (sorry BABS… you let me down in a big way in my 10-team NL-only 5×5 league with suspensions to Dee Gordon and Hector Olivera and injuries to Lucas Duda and Tyson Ross), it’s time to think about next year. My question for BABS (still sticking with you even after a rough beginning) is how does she handle potential keepers for next season? For instance, I can acquire Trevor Story ($10) and Adam Duval ($2) who are outperforming their salaries and their initial BABS ratings but haven’t shown the ability to do it over a full season at the major league level, or alternatively, do I go after even more unproven, but more highly touted, prospects such as Trea Turner ($8) and Julio Urias ($2)? Time to start making things right again BABS. What say you? You can’t fault BABS for Gordon, Olivera, Duda or Ross. You can’t predict injuries or suspensions, and Olivera had EX risk. As for your keeper question, more experience is always better, but until ANY of these players has 2 years under their belt, they will come with risk. Not faulting BABS. More bad luck than anything else. Just venting! Prospects are a craps shoot. Even the most highly regarded prospects can struggle — see, e.g., Urias. Rhe strategy at this point is to acquire as many as possible and see who rises to the top while taking them off of other rosters to lower next year’s draft inflation. 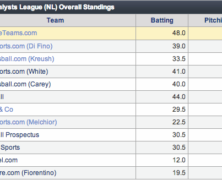 Ron – In those standings snapshots is there any reference to the type of leagues they are measuring? While I think the ranges are somewhat valid that may only be for redraft, non-trading leagues – changing either element would IMO change the figures on winning teams. The original research did not make any distinction about the type of league. We can make an education assumption that it included mostly redraft leagues, and mostly trading leagues, as those were the more prevalent formats in 2002. My keeper league (now in its 29th season) added trading of next season’s draft picks to the equation many seasons back, and I do believe that it has bought time and stretched-out efforts by teams that ordinarily would’ve packed it in, to at least another month or so simply by swinging a pick-enriched deal or two. Right now we’re down to nine owners, but the cash prizes are still worth the grind, as we pay from 1st down to 4th place. We discourage “dumping”, but have found that adding picks to the trading process has definitely encouraged owners to hang in for periods of time that ordinarily would have seen them pack it in and quietly sit out the balance of the season. Slow starts are inevitable, but the odds of being buried and having no shot of competing for a $ slot are mitigated by trades with picks that offer a greater opportunity for one party to benefit in the near term, while the other loads up for the following season’s draft. Our league eliminated dumping trades 15 years ago or more and every year it is a dog fight down to the wire, with most of the teams in the hunt on September 1. Before that, a slow start was a self fulfilling prophesy. If anyone in the league’s above has an opening for next season, please consider this my application! All,of you have the type of leagues that I would enjoy competing and making new fantasy friends in. Thanks!